Meet Boris E. Morley, formerly a Dancing Bear in a circus. When he ran away from the Circus he left his tutu and took the magicians silk kerchiefs instead which he made into a rather handsome scarf. Boris has a Russian mother and a British father and loves to read and drink tea. He also makes the best Vatrushka of the Forest. After the long Rabbit shading experiment I was ready for a new and slightly smaller and simpler furry/shading challenge. Even though it's only a small portrait (approx 3") I used about 8 shades of brown for Boris' fur, ranging from a light cream colour to the darkest of browns DMC has available. Via Instagram and Twitter I received various name suggestions (thanks everyone!) for my Bear and finally settled on Boris E. (for Edward) Morley because I think it suits him. :) I'd love to stitch more of these smaller 'portraits' and giving each character a name and history. Next would be Boris' best friend, I'm thinking that could be some kind of bird. A Robin maybe? Boris E. Morley is very sweet and I love his story. So glad he doesn't have to dance anymore (only if he wants to). Looking forward to seeing his friend! Boris is lovely. And, I *love* his scraf. The colours and pattern are fabulous. Want, want, want! 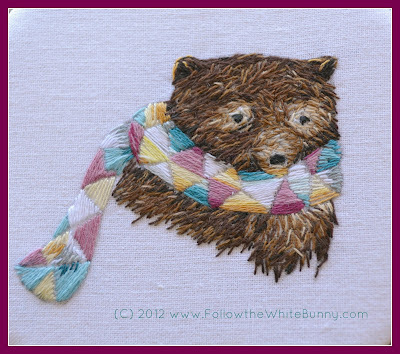 Boris is so wonderful, his scarf and expression are just wonderful! Sweeeeeeeeet! He looks very melancholy. The expressions you manage to get in your stitching is amazing. Note to self *must try harder* ! He is adorable! I love your new header too! And I think a cute robin would be great for his friend.